I am not a connoisseur of Rembrandt nor of any other painter for that matter. I am but a student of the way people gesture. Rembrandt’s portrayal of scenes stocked with people in action struck me as a nice object of study. His capture of a moment and the life within his pictures is widely praised and partly ascribed to his daring portrayal of gestures. His subjects are seldom in rest, and even then not in a neutral rest. Their postures and their hand movements are chosen to tell a story, or to make them extras which add to the story being told. In his famous ‘honderguldenprent‘ the gospel comes alive. It portrays parts of the thirty verses of Matthew 19. We are able to read the picture by the portrayal of the people and by reading the verses in support. We see the great multitudes that he healed flooding through the gate on the right. They plead, and Jesus blesses them. We see the Pharisees discussing, with various co-speech gestures and contemplative postures, the exchange of words they had with Jesus about divorce with Jesus not paying them any more attention. His attention appears mostly focussed on the approaching mothers with children. One child points him out, dragging his mother along. Jesus restrains Peter who is keeping back a mother with infant, welcoming her instead. 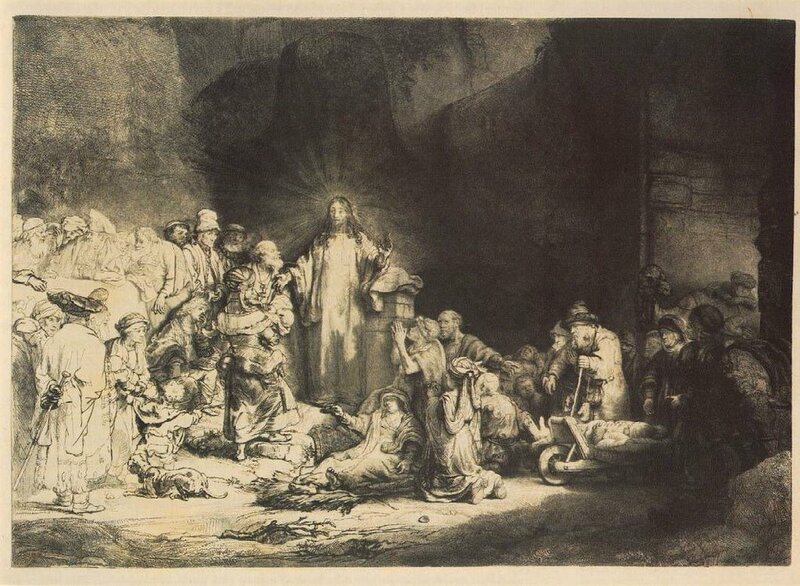 This ‘Hundred Guilder Print’ contains a good part of any of the gestures used by Rembrandt. On the one hand there are emblems such ‘plea’ or ‘bless’ which occur often. On the other hand there are many outstretched hands with either palms up or palms down. These remind me of Kendon’s (2004) treatment of such gestures. One typical example in the picture here is the vertical palm of one of the men trying to make Jesus attend to a particular sick person. At the Rembrandthuis a collection of graphical work is kept of which the ‘genre’ and ‘religious’ material are nice to study. The biblical work by Rembrandt appears to be the most interesting for studying his portrayal of gestures. Simply because they often occur, but also because they are used to aid the rendering of the story, and therefore show a greater variety.